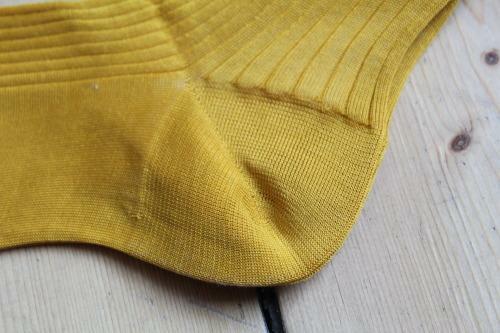 Menswear blog Woollen Hulls reviewed cotton socks made by Di Carlo. The below text is a copy of the original article which can be found here. Outside of the menswear maximalists (who, more often than not, are themselves vendors or salesmen), men wear few accessories. Ties are still mandatory in some professions, but for the most part are a question of choice; pocket squares are always volitional. And since menswear continues to be the more conservative of the gendered dress styles—as it has for several hundred years—most men, when given a choice, prefer not to. Socks are the accessory that everyone wears. At least in Britain, the weather is changeable enough that going sockless is not just graceless but reckless in an office environment. As a result, opinions vary: on one extreme, there’s an opinion that socks should extend the trouser leg and be indistinguishable from it. On the other, there are the “fun” socks: cousin of the cartoon tie, lavished with stripes or spots or, yes, cartoon characters. Some years ago the journalist-turned-teacher Lucy Kellaway wrote a column on Anglo-Italian sock inequality, noting the gulf between fluffy British ankle socks and smooth Italian hosery at a meeting between insurance executives. She’s also opined in the same column that “fun” socks, even those which are simply brightly coloured, are a mark of the immature (or anxiously aging) man. 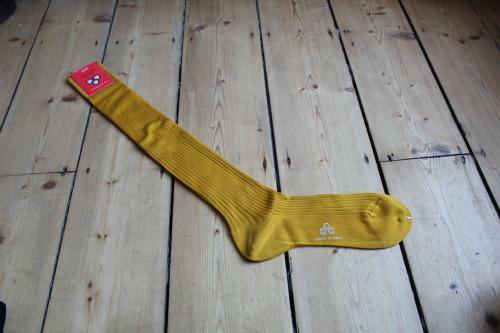 There is, I hope, a middle ground between the socks-as-trouser-extension theory (which seems almost embarrased to admit the sock as accessory) and the ineffectual rebellion of the “fun” sock. Colour without chintz, in other words, can be interesting without being merely attention-seeking. 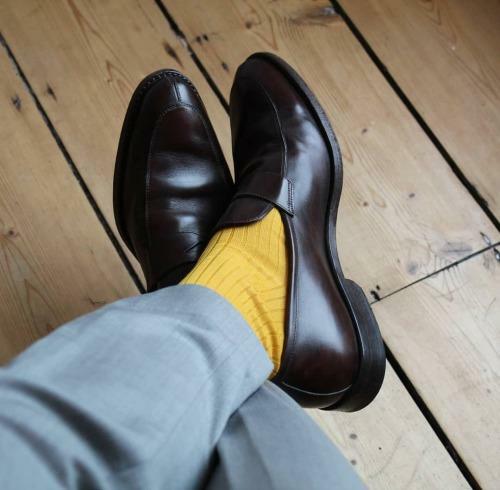 Socks can brighten an outfit without appearing separate from it. 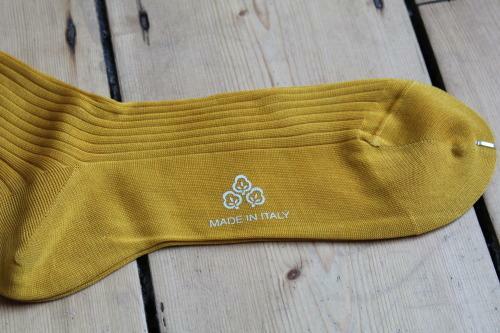 I recently had the chance to try Di Carlo socks, the product of Andea Di Carlo, a businessman who has worked in the US and France, and has sold socks since 1980. Di Carlo sensed an opportunity to sell over-the-calf socks (of the style favoured by Kellaway’s Italian colleagues) in the Anglosphere and France, and after some years as a retailer he established his own factory in Mantua (home of Luigi Bianchi / L.B.M. and other tailors). Di Carlo is available in the UK now thanks to a young company also specialising in Italian manufacturing, The Venetian Trader. Anvit, the owner, sees his role as finding, promoting and distributing Italian makers, rather than re-branding them: his ties and squares are made by the somewhat under-appreciated maker Nicky Milano and his socks by Di Carlo and Bresciani. The Di Carlo socks I tried are solid colour fil d'écosse, a very fine long-thread cotton which feels slightly silky, like a two-ply cotton shirt. Other blends, including wool, are also produced. There is a good range of colours, from the more subtle deep blues and reds to a particularly vibrant orange, but my favourite is this yellow pair: eye catching without being too loud, at least to me. 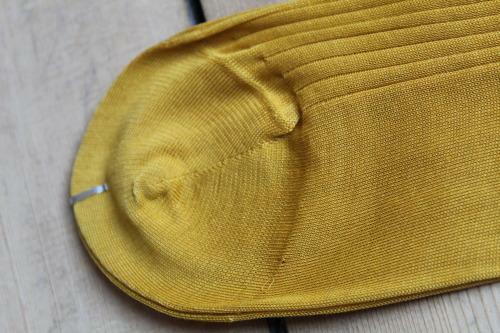 As with other high-quality makers, the socks are finished with a hand-linked toe, and the toe and heel are unribbed. They’re comfortable and lightweight, suited to dress shoes but not to boots. If you’re used to the typical English sock—short, dense cotton, elasticated—they will seem quite different: springy, crisp, close-fitting. The colours are bright and consistent. I also tried machine washing a pair, and found no shrinkage, and washing also reduces some of the silky feel. Di Carlo produce almost 100,000 pairs per year, but many are sold under third-party branding, including by a well-known Parisian internet retailer. In the world of “sartorial” socks these are good value, pleasant to wear, and a solid choice for summer, as boots and heavy dress shoes give way to loafers. 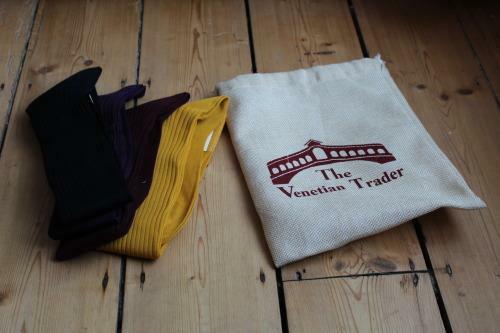 The Venetian Trader, which provided the socks for this review, distributes them in the UK with free shipping. Products discussed were provided without charge for reviewing purposes.